Part of this blog post uses excerpts from an article co-authored by Nick Fesette, a graduate student in my department at Cornell University who has been a co-facilitator with me for PPTG for two years, and myself. The full article is entitled Where the Walls Contain Everything but the Sky: The Birth and Growth of the Phoenix Players Theatre Group and can be found here. 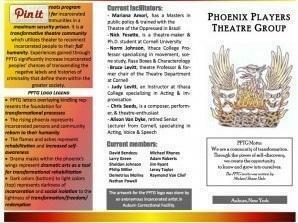 For the past five years I have served as a Facilitator of the Phoenix Players Theatre Group (PPTG) at Auburn Correctional Facility, a maximum-security prison in Auburn, New York. PPTG is a grassroots transformative theatre collective founded in 2009 by inmates Michael Rhynes and Clifton Williamson. The group uses theatre techniques to create an artistic and therapeutic space in which a transformative journey is initiated, leading to personal and social redemption. PPTG is a multi-faceted project, for its incarcerated members and civilian facilitator-participants alike. 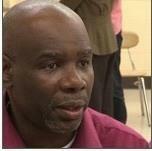 Michael Rhynes, one of the two original PPTG founders, has been incarcerated for over thirty years. “Phoenix” was selected because, to Michael, the Phoenix, rising out of the flames, represented transformation, not rehabilitation. For Michael, rehabilitation is about other people having control over your life while transformation is about taking your own life in your own hands. Witnessing is a critical concept for PPTG and one of the group’s main goals. It is part of the transformative power of the PPTG process. Through the sharing of stories and experiences that spread outside Auburn’s walls the incarcerated members of PPTG might open up in the minds of the public alternate perceptions of themselves and of incarcerated people more generally. We are uniquely poised to bear witness to the group because as facilitators we create, perform, and explore alongside them. With one foot inside the walls and one foot outside, it is our charge to introduce PPTG’s process to a wider audience. It’s challenging to frame how we participate with the men of PPTG because of their complete lack of “power” within their world and our limited ability to “collaborate” with many of those who hold “power” within the prison system, as well as our dependence on the administration to continue to “permit” the program to take place. We can be “locked out” of the facility for weeks at a time based on the needs of the administration to reassert authority or to meet the security needs in the prison. Yet, the administration and the Department of Corrections and Community Services (DOCCS) in Albany have been very supportive of our work to date, granting permission for news stories, performances, the creation of the web site, and the filming of the documentary. This, in turn, has gained the men of PPTG–if not “power”– a bit of “free space” in which to operate–and to experience, for at least two and one-half hours a week, a certain type of spiritual and emotional freedom within the larger context of their incarceration. Finally, there are the barriers to open communication between those of us who are “facilitators” and the men in the group. We cannot call them or write to them, nor can we be seen as “facilitating” communication from them to others outside of the facility. We cannot communicate with their families either. We can only participate with them in those two and a half hour sessions once weekly. Perhaps this is what makes the ability to create the web site such an extraordinary departure from those constraints on our contact. What we share with other P/AR work is the collaboration that happens “in the room” each Friday evening, our complete acknowledgement that the Men of PPTG are THE experts on their environment and their journeys, and our functioning as providers of information and facilitators in the fulfillment of their goals. How the work with PPTG may differ from other groups that use the practice of theatre as a therapeutic process is the craft work we engage in with the men so that they acquire the skills of performers in order to best dramatize their writings and learn to present themselves to the audience in as professional and skillful manner as possible. This craft- work, too, contributes to their ability to manage their everyday life in the prison by assisting them in communicating clearly and directly. The men also learn how emotions manifest themselves in others, as well as themselves, and so they not only become aware of how to mange their emotional life, but also how to avoid situations that might be detrimental by coming to know that they have no need to engage with others whose emotions might be out of control. That by translating the personal into performance pieces to be “witnessed” the men not only get closer to completing the cycle of their “transformations” but have something to offer the culture by coming to such an intimate understanding of the root causes of their decisions that landed them in prison and sharing those discoveries with the public. And by putting themselves and their lives on display, and by developing theatre techniques that assist them in becoming more than competent performers, they engage their audiences in becoming “witnesses” as well and not only “entertain and educate” through theatre but help to translate their world into something that audiences can experience more directly. As one audience member testified during the post-show talkback, PPTG’s performances make the world “bigger” and “better,” make the brain “smarter,” and lend meaning to the experience of being a human sharing other human experiences.